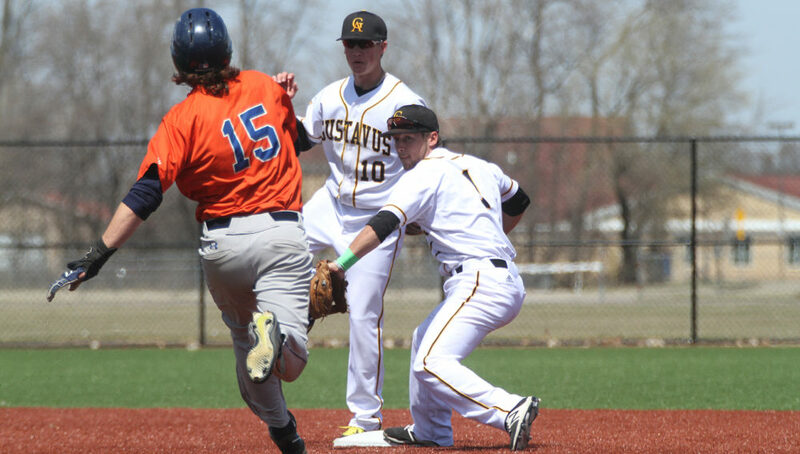 ST. PETER, Minn. – The Gustavus baseball team was swept Sunday afternoon during senior day at Gustie Baseball Field, dropping two games versus Macalester College in a Minnesota Intercollegiate Athletic Conference doubleheader. The Gusties (12-15 overall, 4-8 MIAC) were limited to seven hits through two games while the Scots’ solid pitching in game one and offensive power in game two led to 5-0 and 10-3 victories. Joe Trier kept the Gustavus offense in check in game one as he completed the shutout in the mound for the Scots, allowing the three Gustie hits. Macalester got off to a nice start, scoring all of its runs in the first three innings. A two-run homer by Collin Brantner in the first inning stood as the game-winning runs batted in. Adam Stockwell (Jr., Apple Valley, Minn.) took the loss for the Gusties, allowing five runs in three innings pitched. First-year pitchers Damon Rademacher (Princeton, Minn.), Torben Urdahl (Chanhassen, Minn.), and Gavyn Walsh (Andover, Minn.) finished the game with scoreless outings. An eight-run fourth inning in which the Scots notched their second and third homers of the game, including a grand slam by Carl Francalangia proved to be the difference as they claimed a 10-1 advantage. The Gusties came back with two runs in the bottom half as Macalester starting pitcher Andrew Polk struggled to find the strike zone, throwing multiple wild pitches to allow one run prior to a Matt Berkner (Jr., Sleepy Eye, Minn.) RBI groundout, trimming their lead to 10-3. Jacob Simpson then came in to relieve Polk and pitched the final 3.2 innings of the game to earn the win. Charlie Hutchinson (Fy., Maple Grove, Minn.) took the loss on the hill for Gustavus, allowing six earned runs in 3.1 innings pitched. The Gusties look to bounce back on Tuesday, heading to Northfield, Minn. for a MIAC doubleheader at St. Olaf College. Game one is scheduled for a 2:30 p.m. start.